Kishore Kumar » Blog Archive » Birthday Celebrations – Kishore Turns 81! Home » Specials » Birthday Celebrations Kishore Turns 81! Birthday Celebrations – Kishore Turns 81! 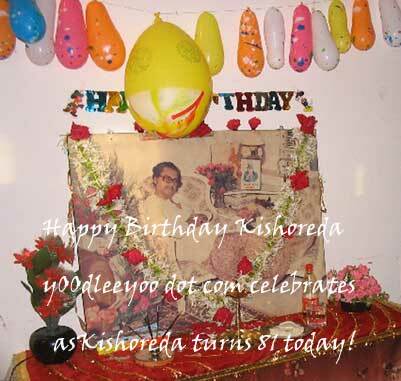 Yoodleeyoo celebrates Kishoreda’s birthday today on August 4, 2010. Listen to Kishore songs all day on yoodleeyoo radio. 1. Ms Madhavi – Kishore Kumar and S D Burman in the Fifties : Recognizing a Genius. 2. Mr. Arghya Dutta – Kishore Kumar-Gulzar : Deep Voice in Deep Poetry. 3. Post your wishes to go online on this site.. This entry was posted on Wednesday, August 4th, 2010 at 1:23 pm	and is filed under Specials. You can follow any responses to this entry through the RSS 2.0 feed. You can skip to the end and leave a response. Pinging is currently not allowed. Today is Great Indian Legend – The Invincible , One and Only One – Our Favorite – KISHORE KUMAR’s B’day. I wish him a very Happy B’day direct in Heaven. When he was alive and ruling we werenot born. But the quality and type of work that he did speak volumes. When he was dead a Program by AMEEN SAYANI on DD 1 and old songs in DD 1 grabbed my attention. At that time industry was looking for KK sing alike in the form of Kumar Sanu , Abhijeet , Debashish Dasgupta and so on. But nobody can never match that magic at all. That program from AMEEN SAYANI and today the You-tube videos are the memories that i always cherish. The amount of effort ,energy and enthusiasm that he put in his songs is missing today. Be it the LOS ANGELES NIGHT, WEMBLEY NIGHT, KK in KHANDWA and so on. I don’t have words to express the Genius Approach of him. Like a dialogue from ANAND , KK kabhie marte nain , KISHORE DA mare nahin. He will always remain in our memories like Fresh Air. HAPPY BIRTHDAY TO MAHAGURU KISHORE KUMAR,YOU ARE THE GREATEST.TODAY THERE ARE SO MANY PROGRAMMES IN TV,RADIO AND ALL OVER INDIA TO CELEBRATE GURU’S BDAY.KISHOREDA WILL REMAIN AN INSPIRATION FOR MILLION YEARS. HAPPY BIRTHDAY KISHOREDA..MISS YOU SO MUCH……..
KISHORE KUMAR IS A GOD IN MY LIFE.WE KNOW THAT ‘WHAT IS GOD’…..MANY MANY RETURNS OF THE DAY … HAPPY BIRTH DAY TO KISHORE KUMAR. I just came across this page. This is an awesome effort to keep the fan spirit alive. Kishore da still lives in all of our hearts. Mai aapk Daddy ko happy birthday wish karta hu.81st HAPPY BIRTHDAY TO MAHAPRABHU KISHORE KUMAR.MANY MANY RETURNS OF THE DAY.Mai aapk Daddy k gaaye hue sabhi songs ko kabhi bhool nahi sakta.Aapk Daddy aaj bhi singing me forth generation ko represent kar rahe hain. Mai jab 3 saal ka tha tabhi se aapke Daddy ki aawaj pahchan raha hu.jaise jaise mai bada hota chala gaya waise waise aapk Daddy ka diwana banta chala gaya.Wo Radio ka jamana tha jab mai sirf aapk daddy ki aawaj sunne ke liye radio pe band badal badal k song search karta rahta tha.jab ki us jamane me Mhd.Rafi-Mukeh jaise bhi singer the.Isi se aap andaja laga sakte hain ki mai aapk daddy ka kitna bada fan hu. Aapk daddy ka gaya hua gana ‘PHOOLON KA TARON KA SABKA KAHNA HAI………….’Bhai Bahno k liye.isse accha song koi ho hi nahi sakta.Apka keya kahna hai? Doston me bhi ap sub ki tarah kishore da ka crezy fine hoon.Un ki awaz mere liye bohat ahmiyat rakhti hai.Meri her subah ka start un ki awar se hota hai aur phir sara din un ki awaz mere saath mere jism me lahu ban kar dhorti rehti hai. rafi sahab is best.this is my heart&kishore sahab my life. jo log kahten hain ki rafi sahab is not best wo log kabhi safalta tak nahi pa sakte kyonki ragi sahab is the angel of voice & kishore sahab is the melody guru of voice.rafi sahab and kishore sahab is same not different. 4th August & 13th October…. looking 4ward to 4th of August 2011. my deepest & sincere wishes & gratitude to all u special folks all over the world! luv u all. aap se pahle na koi tha, aap ke baad na koi hai aur aap jaisa na koi aayega..
whenever i listen to the number from “safar”-written by indivar, “zindagi ke safar, hai ye kaisa safar”-i just go sentimental………i have never heard anything sung more pasionately by kk than this number……….the words are so apt…………another favourite is——-mere dilne tarap kar jab naam tera pukaara. from anurodh……………incidently, if one really wants to credit kk for turning from yodelling to serious singing, then that credit must go to two people-r d burman and anand bakshi, and of course, not forgetting laxmi-pyare………..(daag———–mere dil me aaj) now, all the above songs were picturised on………………………..kaka-so he is the man that brought kk into the limelight after his career dipped. so, if anyone really “challenged” rafisaab, it was not mukesh, talat, mahendra kapoor—-it was kk. unfortunately, sachinda did not see his famous crooner bag the many awards subsequent to his (sd) death…..but then pancham got the plaudits………………………….. Happy Upcoming auspicious Birthday to ‘BHOGOBAN’!!!!! Can ne1 have the kishore kumar’s English song?? only one song he sang in full english. I don’t know whether it is melodious or buffonery.But he sang..And some regional songs and his live function also.. If anyone have all these, then Pls contact me at this no:- 9804138512. And I can’t understand that what about his Live function videos?? Most valuable is Live at Los angeles!! where is the video in good dvd resolution?? WHR? WHR? WHR? while his popullarity risen up to the sky at present… Now we have to believe it was not being recorded! ha ha.. Is it?? EVERYTHING IS POLITICS N NOTHING ELSE!! I was lucky to be at khandwa on dada’s birthday. i felt he was everywhere,with us.LOVE YOU DADA. Happy birthday to Kishore da. Your songs will live with us for long long time with us. And what songs did you sing for us……..Diyen Jalte Hai, Mai Shayer hun badnaam, Rim Zim Gire saavan, Phoolonke Rangse, Phoolon ka taaron ka, Koi Humdum Na Raha, Yeh Jeevan Hai, Yeh Sham Mastani, etc etc etc. You are eternal singer Kishore Da!!!!!!!! I love kishore kumar and miss u so mach. In life’s ups and downs, Kishoreda’a songs give me new lessons every day. I sadness he gives strength to live and in joy his voice is a celebration. Koi Ladki pasand ai to Kishoreda gaane lage “Ek Ladki Bhigi Bhagi Si”, kisine dhoka diya to Kishoreda ke gaya “Rona Kabhi Nahi Rona Chahe Tot Jaye koi Khilona”, koi rutha to Kishoreda ne mana liya “Ye kya Hua “. Zindagi ke akhri din tak KK ke gaane sunta rahoonga aur unhe pranam karta rahonga. KK aap amar hain… hamara sab ke dil me. after dying and going to heaven,I will pray to GOD for sending me to my soul-kishore kumar.Kishore Da,You are my soul,your name is written in every atoms of my body. « Kishore Kumar and S D Burman in the Fifties : Recognizing a Genius.